South East Wales Brass Band Association's Autumn Festival Contest was held yesterday (Saturday 24th November) at Willows High School Cardiff. Congratulations to Llwydcoed, who were victorious in the Championship section, under the skilful direction of Christopher Turner, with a superb performance of ‘Between the Moon and Mexico’. As well as scooping up prizes for the best bass section and best trombone, it was a special day for the band as it was the first time for Richard Davies to lead the band on the end chair, after being persuaded to return and ‘help out’ nearly two years ago, having started his playing career at Llwydcoed 40 years earlier. The win also brought back fond memories for the MD too, who was part of the Brighouse and Rastrick Band’s National victory on the same test piece in 1998. 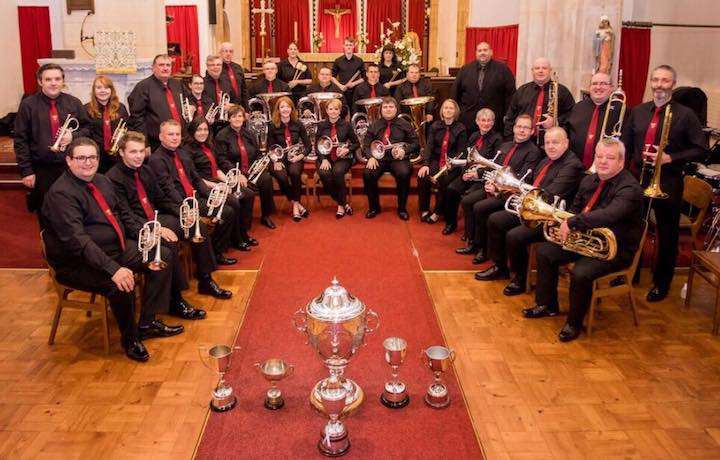 The event was also the final contest of the Welsh League system, which determines the champion band in each section as well as league promotion and relegation ready for next year’s series of contests. Congratulations to the winners of all sections. Full results of the contest and league can be found below. 1st A W Parker Drybrook, Joshua Ruck winning the South Wales Miners Gala Trophy. Best Instrumentalist, Andrew Jones, Solo Horn, A W Parker Drybrook, winning the SEWBBA Trophy. 1st RAF St Athan Voluntary Alan Bourne winning the Western Mail Trophy. Best Instrumentalist, Andy Watkins Soprano Cornet, Abertillery Town, winning the Fred Western Memorial Trophy. Best Trombone Section Crwbin, winning the Mike Tilley Memorial Cup. 1st Taff Vale Brass Gareth Ritter winning the Mel Huntley Memorial Trophy. Best Instrumentalist, Duncan Broadley, Solo Cornet, Taff Vale Brass winning the Rhondda Cynon Taf CBC Trophy. Best Horn Section, Taff Vale Brass winning the Mavis Thomas Memorial Cup. Youngest Player in the 3rd& 4thSections Noah Davies aged 8 Ynyshir Band, winning the Fred Tape Shield. 1st Gwaun Cae Gurwen Robert Burnett winning the Hawkes Challenge Shield. Best Instrumentalist, Dafydd Lewis,Euphonium, Gwaun Cae Gurwen winning the Evan Evans Bevan Trophy. Best Instrumentalist, Scarlett Norman, Solo Horn Ebbw Valley Academy winning the 4BarsRest Trophy. Best Cornet, Graham Middleton, Newport Borough Training Band, winning the Arthur Batten Memorial Award. Best Percussion, City Of Cardiff Youth (M3) winning the Ev-Entz Shield. Youngest Tuba Player, Annie Duque aged 11, Newport Borough Training Band, winning the Gwyn Press Memorial Trophy. Youngest Player, Sebastian Nader-Humphries aged 7, Newport Borough Training Band. Conductor of the Year, Gareth Ritter, winning the Eric James Memorial Trophy. Champion Band, Taff Vale Brass, winning the T J Powell Trophy. Runner Up, Crosskeys, winning the Mal Griffiths Memorial Trophy. Champion Band, Newport Borough, winning the T J Powell Trophy. Runner Up, Seindorf Arian Crwbin, winning the Steve & Jeff Trotman Memorial Trophy. Champion Band, Burry Port winning the Ruby Protheroe Memorial Trophy. Runner Up, Abergavenny Borough, winning the South Wales Miners Gala Trophy. Champion Band, Ebbw Valley winning the Miners Gala Trophy. Runner Up, Pontardulais winning the Tom Trotman Memorial Trophy.